- What’s the preferred file type: RAW, PNG, TIFF or JPEG? - Why don’t the prints I ordered look as good as what I see on my computer monitor? - My last order of 8×10 inch prints didn’t look as good as my 4 inch prints. - I have a choice on my camera for quality / megapixel settings, which should I use? - I recieved my photo gift and the quality is different from the original printed photo, why? These questions are answered in the information provided below. If you still have any further questions, please do not hesitate to contact usfor more detailed information. There are a number of file formats available for saving pictures such as RAW, PNG, TIFF, JPEG, GIF, etc. Each of these formats has a useful purpose; if you take lots of pictures, you may want to move beyond PNG or JPEG file format which is usually the default on most digital cameras. Whether shooting in JPEG or RAW, remember to back up photos after moving them from the camera to the computer. Burn them to a DVD, or transfer them to a portable hard drive kept in another location – away from the computer. Better yet, seek the advice of a local photo retailer for archiving and storage options. What size should I save them at? It can get very confusing what quality or format to save your images, however if you plan on one day printing your images it is recommened to save them at one of the largest size as you can always scale them down with various software or online tools. This is also dependant on the amount of space on your memory stick or in-built camera storage space so aim for a larger size where possible, but if you can only save 10-50 photos at the largest size you may prefer going down a size or two for a lot more photos to be saved at slightly lower sizes which are still good enough to print. Web page images tend to load quickly because they are reduced in size for optimum loading speed. The same occurs with most photos posted on social media websites such as facebook, myspace, twitter, etc. Photos posted on social media website are usually not ideal to use for printing as they appear clear on a computer screen but are much smaller when printed out with a printer. It is usually best to use the original photograph where possible for printing. GIF, PNG and JPEG are usually the most preferred image file formats for web pages because they can be saved at lower quality than RAW or TIFF file formats. For those special images you want to print and display, the preferred file format is TIFF. TIFF is an uncompressed file format which hasn’t been reduced in any way and preserves all of the original settings. RAW file formats are also very large like TIFF files, but less commonly used online and between different camera versions so you may later find compatibility issues using default RAW settings. For lots of amateurs and family photographers, JPEG is just fine. Make sure the camera is set to the highest quality resolution setting and to save pictures with the least amount of compression. The camera manual will explain how to do this. A photo retailer can also help. JPEG is fine for snapshots, but you have limited ability to correct overexposed or underexposed areas. A professional wanting greater control will probably shoot in RAW or TIFF file format. Most websites and photo kiosks these days tend to easily recognise JPEG file formats over RAW formats too. JPEG is also usually the recommended format for sharing images on the web or by email as it is usually a smaller file size than RAW file formats. RAW format allows a photographer to capture more detail than when shooting in JPEG format; it also provides more control over color correction and exposure adjustment in the digital darkroom. The ability to change the white balance on a RAW file or dig out some extra detail in highlight and shadow areas can make an immediate impact on the overall look of a photo. Since RAW files do capture lots of detail without applying processing or compression algorithms, they will take up more space on a memory card and hard drive. If your camera offers the opportunity to shoot RAW, pick up a few extra memory cards so you can save in larger formats. RAW files can create a problem because different camera manufacturers have different “flavors” of RAW. For example, Canon RAW files are known as .CRW, Nikon files are .NEF, Pentax files are .PEF, and Olympus uses .ORF. The DNG format (for “digital negative”) was recently created by Adobe in an effort to unify the slightly different RAW formats created by the various manufacturers. Many photographers fear these differences may potentially become problematic in the long term, as one manufacturer’s RAW files may not be futureproof in new software applications. To protect digital negatives (RAW files) for many years to come, converting them to DNG, TIFF or JPEG may be well worth the effort. The presumption is all new software will recognize DNG, TIFF and JPG, while some RAW versions particular to a manufacturer may fall by the wayside and possibly be unreadable in the future. Shooting pets can be one of the most rewarding types of photography one can do, but it’s not as simple as it may seem; they move – and very quickly! One way to solve this problem is to restrict the areas into which your subject can bolt. Ways to accomplish this task are to place kittens in baskets and puppies in buckets, nestled into wingback chairs, placed on picnic tables, or even on stumps tall enough to make them think before leaping. Kitties are just as difficult to corral and wrangle; but they too can be confined to a specific area, giving you enough time to photograph them before they have a chance to remove themselves from their portrait sittings. The fence concept is a great way to allow your kitty to be free to move about, back and forth, but always at the same distance from the camera, give or take a few inches. Peeking from tall boots or even sitting on top of their dog houses might also work. Getting help from the pet owner, or even a friend if it’s your own animal, is a must for shooting animals. Not only will it make the shoot go easier, it will be a lot of fun. Remember to focus on the eye nearest the camera. It’s difficult to do close-ups that aren’t looking squarely and directly at the face, in which both eyes are in focus. When presented that choice, just remember to focus on the eye nearest you. If you have a friend or family member around, they can also distract your pet with either a toy (squeaky ones work great with dogs, but can scare cats away) or small treats. The best treats are ones that can be gobbled and not chewed. Rewards are quick, and you waste no time waiting for them to finish. This kind of assistance should also allow for some more or less candid photography, as your pet is now paying attention to the food and/or toy provider and not worrying about you and the camera. Other tips for shooting your pets might be to include other members of your family. The interactions can be fun and provide some idea of scale. For pet dogs you could try throwing an object (ball, bone, frizby, etc) that they can fetch and bring back to you and get a great mid motion shot as they are returning to you. You might have to do this several times to get the right shot depending on the shutter speed on your camera which may go off too early or late on initial attempts. 2. Incorporate Play – some pets are extremely playful and arent able to sit or stand in one position for even 10 seconds. Work with their active personality. 3. Keep the Set Small – some pets frighten easily, so help them feel safe and secure in a smaller setting away from excessive chaos. 4. Use Props – props act as a distraction for your pet, so make sure to have plenty of familiar favorites on hand. 5. 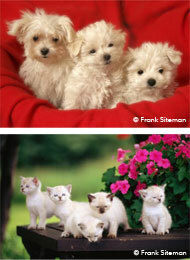 Get Pre-Photo Excercise – an overly-energetic pet can make it difficult to get even one good shot. Burn off any excess energy. 6. Play Music – relaxing music can ease the photo-shoot and help your pet to focus. 7. Kneel Down – Put yourself in your pet’s position, it can be a bit intimidating to have a human towering over you. 8. Go Candid – After you’ve snapped your posed pictures, take a few candid shots when your pet isn’t looking. Once you’re done with the photo shoot, preserve the memories of your pet in a keepsake photobook, calendar or photo gift. Your precious pet is a beloved part of your household. When it comes to special occassions like weddings, reunions or birthdays, why leave them behind. These five simple ideas can help you incorporate your pet into special occassions. 1. Make your pet part of your wedding. Have your pet greeting guests, act as ring bearer or sit at the alter as part of the wedding party. 2. Celebrate holidays together by integrating them into festivities; hang and stuff a stocking for your pet at Christmas or fill an Easter basket with pet friendly goodies. 3. Hold a pet friendly reunion. Its great to see family at an annual reunion, why not include your non-human family members. Arrange games that pets and people can play, set up a pet-friendly buffett. 4. Host a pet party and celebrate your pet’s birthday or adoption day. 5. Give a small gift at birthdays or Christmas from your pet to say “Thank you!” for the love and attention they receive.